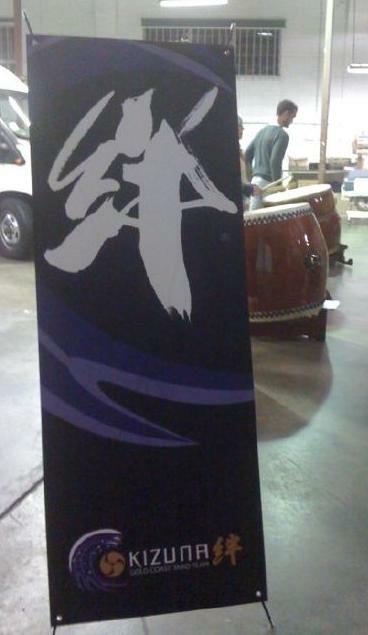 KIZUNA is a TAIKO performance team based in Gold Coast. I saw them in Coffs Harbour when I joined in an event Japan Festival 2010. I had a good oppotunity to draw their logo and finally it became a barnner like this!!!! How nice it is!!! I hope they like it. This was the collaborated exhibition with flower artist Setsuko and ceramic artist Malcolm. I was really happy to have an exhibition in Japan Foundation finally. There were more than 400 people joined in the opening ceremony on 8 October 2009. Consul general Hobo gave a speech in the party. All of my works were Scrolls. We realised it was the perfect combination between scroll and flowers with a pot. This is one of the best 和 beauty, don’t you think?